The use of biometrics—computers verifying identities through physical characteristics—and other automated techniques in airport security is raising questions about the strengths of man versus machine in detecting potential terrorists. Industry officials argue the advantages outweigh the risks, and are promoting automation to help make air travel more efficient and less frustrating—and to save money. 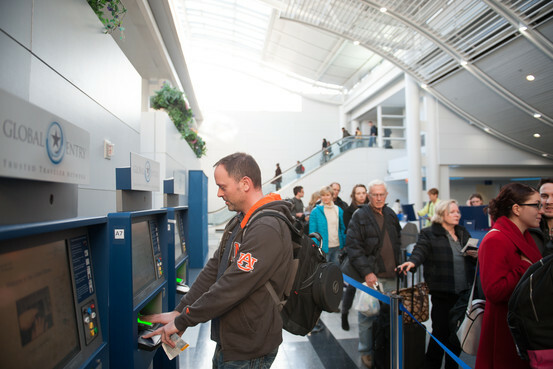 Every day hundreds of thousands of travelers are subjected to long lines and intrusive screenings by the Transportation Security Administration. Under the pretext of protecting Americans from terrorists the TSA, an agency which has never actually captured a terrorist in its ten year history, has spent billions of dollars on what they claim is a necessity in today’s dangerous world. But with all the money being spent and a government control grid being implemented across the entire country, a cross-dressing fence jumper somehow managed to thwarta multi-million dollar impenetrable external perimeter defense system at Newark airport. He allegedly scaled the security fence and rambled unnoticed across two runways before trying to enter Terminal C, where he was confronted by a United Airlines worker, who called cops. The PIDS system includes cameras that watch the airport’s outer fence, which is topped with barbed wire and lined with sensors to detect climbers. It remains unclear why Bryant was not spotted. “Everybody was called on the carpet about this, which is rather unfair, since they have no control over a substandard security system,” the source said. If the PIDS system worked? A $300 million security system installed to protect Americans from the dastardly threat of homegrown and Al-Queda terrorists and it is substandard and not functioning? So much for scrubbing granny’s wheelchair for explosive residue at the airport’s TSA checkpoint, when an intoxicated individual dressed in bright clothing can jump a fence and enter one of the busiest airports in America without being detected. The 31-year-old North Carolinian doesn’t like to discuss politics. He’s not anti-government. He says he just wants people to be informed. Another example of the TSA behaving like a bunch of out of touch, authoritarian goons with no common sense. The St. Louis “agents”(more like glorified mall security) confiscated a toy gun from a womens stuffed monkey she was traveling with. The agents claimed the miniature sized toy gun could be ‘confused’ as a real weapon — Phyllis May, owner of the stuffed monkey, owns a business making sock monkeys and was also questioned about sewing supplies present in her bags. Different private contractors whose only goal was to ensure the passengers’ safety once managed the service that TSA now offers. What was their incentive to do a great job? Making sure everyone is safe. Why? Because they would be out of business if a plane were to be hijacked or bombed. But what happens if the TSA fails? Absolutely nothing. By all accounts, the TSA is a hassle to travelers and highly inefficient, mostly because the agency can afford to be inefficient. They have nobody to compete with so, should we abolish it?